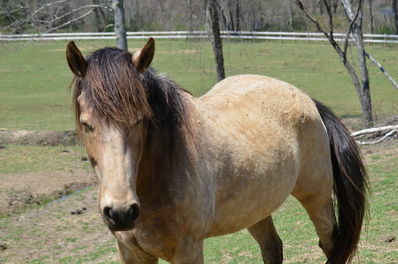 Cajun is the only Buckskin in the herd, which is kind of cool if you ask him! His specialties are beginner riders and trail rides. He eats like he’s an equine garbage disposal – he could eat and eat and eat until he explodes. He loves hanging out in Apache pasture with his best friend, Clyde.